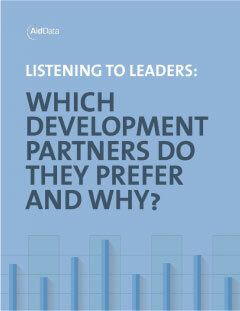 Key findings from this survey are summarized in two flagship reports by AidData: The Marketplace of Ideas for Policy Change and Listening to Leaders: Which Development Partners Do They Prefer and Why?. For an explanation of files in the dataset download and a description of the variables used, please see the associated ReadMe. Please note: Both sources should be used as the official citation for the 2014 Reform Efforts Survey aggregate dataset. Updated in: AidData. 2017. The 2014 Reform Efforts Survey Aggregate Dataset. Williamsburg, VA: AidData. How do we measure the influence of development partners on policy reforms in low- and middle-income countries? There previously existed no metric of policy influence that allowed us to quantify and compare the extent to which different development partners shape the trajectory of reform process in their partner countries. With the aim of filling this knowledge gap, AidData, a research lab at William and Mary’s Global Research Institute, conducted this global elite survey, or the 2014 Reform Efforts Survey, in the summer of 2014, in partnership with the National Opinion Research Center (NORC) at the University of Chicago. This first-of-its-kind survey was explicitly designed to provide timely, detailed, and accurate data on the trustworthiness, influence, and performance of 100+ Western and non-Western development partners, as observed and experienced by in-country counterparts. The survey ultimately benefited from the participation of nearly 6,750 development policymakers and practitioners in 126 low- and middle-income countries. The survey implementation was preceded by five years of painstaking efforts to identify the population of our interest, which includes those individuals who are knowledgeable about the formulation and implementation of government policies and programs in low- and lower-middle income countries at any point between 2004 and 2013. See more details on the process of sampling frame construction and the survey questionnaire in the online Appendix of the 2015 Listening to Leaders report. We successfully constructed a sampling frame of approximately 55,000 host government and development partner officials, civil society leaders, private sector representatives, and independent experts from 126 low- and lower-middle income countries and semi-autonomous territories. Of those individuals included in the sampling frame, we successfully sent a survey invitation to the email inbox of over 43,427 sampling frame members. From this cohort of survey recipients, 6,731 participated, yielding an overall, individual-level survey participation rate of approximately 15.5%. Funding: This research was made possible through generous financial support received from the Smith Richardson Foundation, the John Templeton Foundation, the College of William & Mary, the London School of Economics and Political Science, and the World Bank.